Let Jet Direct Mortgage invest in your success! Jet Direct Mortgage is a firm believer in investing in our sales professionals – which is why we equip them with the most powerful and robust tools available! GoMortgage is Jet Direct’s exclusive mobile app available to members of our sales team. You Benefit. Your Partners Benefit. Your Borrowers Benefit. Everybody Wins. How many times have you spent evenings and weekends at the office, or had relaxation or family events interrupted to order pre-qualification letters, pull credit or follow up on borrower calls? With GoMortgage, you can be a star performer without giving up family time, or quality of life, because we bring the office to you. Let’s face it, all homebuyers dread the mortgage waiting game. With GoMortgage, you can turn borrowers into your greatest fans. Easily provide real estimated monthly payments, then keep them in the loop with automated milestone updates and alerts when they have documents due. Getting the right documents to you at the right time isn’t always easy for your borrowers. With GoMortgage, your borrowers can securely scan and upload their documents, using nothing more than the app and camera on their mobile device. You get what you need faster, without inconveniencing customers. How much does having mobile access to your borrowers, your realtors and your systems impact efficiency and close rates? The data shows that using GoMortgage, originators can close loans up to 20 percent faster. That means you can sell more, and make more, without devoting more time to your job. Boom! 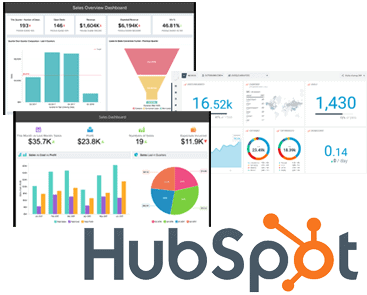 HubSpot CRM is everything you need to organize, track, and nurture your leads and customers. Manage your pipeline and speed up your sales team with the CRM that’s free, forever. You want to sell – not fight with messy spreadsheets, cluttered inboxes, or clunky tools that slow you down. HubSpot CRM automates the tasks you hate and takes minutes to learn – not months. That means doing more deals and less data entry. Plus, interactions are tracked automatically and deals are displayed on one dashboard for total visibility without added work. HubSpot’s free CRM makes staying organized effortless. Manage your pipeline with total visibility. Get an up-to-the-minute view of your entire sales funnel on a clean, visual dashboard. You can sort deals won and lost, appointments scheduled, and contracts sent over any time period, and track performance against quotas you set. Sort deals by name, owner, amount, or stage with custom filters for actionable intel in a fraction of the time. HubSpot CRM tracks customer interactions automatically – whether they’re in an email, across social media, or on a call. Sync with Gmail or Outlook, and capture every call, email, or meeting as it happens. See everything about a contact in one place. Go way beyond names and job titles. Every interaction is stored in a tidy timeline, including calls, emails, meetings, and notes. You’ll never need to dig through a messy inbox or spreadsheet to figure out where a relationship left off. Sync up with HubSpot’s marketing software, and you’ll know which content your lead has consumed so you can personalize your approach. Chat with prospects and customers in real time. Start building better relationships with your prospects and customers through personalized, one-to-one conversations. HubSpot CRM includes free tools for live chat, team email, and bots, plus a universal inbox that gives sales, marketing, and customer service teams one place to view, manage, and reply to all conversations — regardless of the messaging channel they came from. You’ll find it easy to manage one-to-one communications at scale.